Mourning Sickness: Hegel and the French Revolution begins with the question of the cultural disenchantment facing Germany in the aftermath of the French Revolution, an historical condition that, following Marx and Engels, came to be called the “German misery.” This disenchanted position results from the awkward acknowledgment that “Germany’s experience of modernity is a missed experience,” the trauma of which Rebecca Comay uses as a category of history, with the “German misery” being an exemplary model of her approach and Hegel representing “its most lucid theorist” (3-4). Hegel’s philosophy stages history not only as a response to or record of events, but also as the history of making history. As spectators of the French Revolution, Germans were able to take on the feelings of thrill and terror while remaining at a privileged distance; yet, the possibilities of this encounter appear only as the lost possibilities of a “future already passed,” with Germany being “in the melancholic position of mourning the loss of what it had never experienced as such” (3). In Comay’s reading, this is the cornerstone of Hegelian history, which locates the modern subject within an unbridgeable temporal gap that separates an already lost past from a forever unattainable future. The French Revolution is “the burning center of Hegel’s philosophy” precisely because it is experienced (as seen from Germany) as an indirect accounting of the experience that makes it an event (5). Crystallized in Germany’s response to the French Revolution, as Comay convincingly argues, is “the untimeliness of historical experience” that defines history—particularly in light of Marx’s critiques of Hegel—as a virtual, vicarious and even voyeuristic encounter in which we are “forever latecomers and precursors to our experiences, outsiders to our most intimate affairs” (4-5). The most exceptional aspect of Comay’s study is her argument for the untimely as a key feature of modernity. Through untimeliness, the “German misery” is extended into the more general malady of the modern misery, a condition resulting from the persistent incongruities of the self’s quest for meaning and ‘truth’ in a world increasingly understood as inherently meaningless and relative. As modern subjects we are (or consistently feel like) latecomers to a world whose experience seems beyond the capabilities of our bodily senses. From this perspective, to be human in the modern sense is to be untimely since our experiences are always already repetitions of previous experiences that we knowingly or unknowingly missed; or, as Comay eloquently states, our “experience is the experience of the impossibility of experience” (128). Comay’s proposal for untimeliness, as she succinctly outlines in her introduction, describes the fundamental relationship that Germany in general and Hegel specifically has with the French Revolution: the trauma of the event is resolved by replacing the lived experience with a symbolic representation of experience that is aesthetically detached from the reality of the Revolutionary events in-themselves. Let us consider this untimeliness in more detail. The Revolution, says Kant, “finds in the hearts of all spectators (who are not engaged in the game itself) a wishful participation that borders closely on enthusiasm, the very expression of which is fraught with danger; this sympathy, therefore, can have no other cause than a moral predisposition in the human race” (Kant 302). Distinctly outside of the event itself, a subject can experience the social and political upheaval of the Revolution as an aesthetic phenomenon, the judgment of which is not prejudiced by personal involvement or interest but is instead based within a contradictory mode of, to return to the major theme of Comay’s text, anticipating a missed experience. And yet, through history we also feel like precursors to a world of greater knowledge that, since Kant, is the privilege of an interiorized subjectivity. The basic tenets of this move towards an inner subjective judgment are present in the 16th century Protestant Reformation, with Luther making a marked appeal for the ability of people to interpret the Bible for themselves without recourse to Church authorities. It is primarily on this basis that Germany laid claim to the legacy of the French Revolution, believing the Reformation to be its obvious predecessor, even while denying any direct link to the events taking place in France; Germany can thus “celebrate, surpass, and mourn, at a distance, what was never its own to experience firsthand” (1). This distance is all-important for German Idealism, since it is strictly through the separation of self and world that Kant believes freedom is truly possible—an untimely freedom that is the purview of spectators, those who passively look at rather than participate in, whose engagement with the world is authoritatively aesthetic. Through the untimeliness of modern experience we enter what Comay terms “the Kantian theatre” (as she titles her second chapter), a space in which—drawing notably on Hannah Arendt’s reading of Kant—“political judgment is an extension of the aesthetic judgment that simultaneously finds and founds the cosmopolitan collective as the sensus communis of the enlarged community; judgment performatively invents what it discovers” (34). From this Kantian point-of-view, defined as it is through the common sensations of a generalized or universalized subjectivity, the events of the French Revolution are experienced as if originating in the viewing subject that wills it strictly as a representation divorced from any reality. This, stated simply, is the broken subject of which Comay speaks, a self for which the “world ceases to present a mirror in which I can recognize the objectified imprint of my own activity” (146). Such an untimely and broken subject is based upon Kant’s “world spectator,” who according to Arendt “decides, by having an idea of the whole, whether, in any single, particular event, progress is being made” (Arendt 58). Without a belief in the basic similarity of self and world, without a verifiable relation between (inner) experience and (outer) reality, the activities of the modern subject exist in the experience of untimeliness that is translated into an idea of the whole. Through Kantian judgment, acts (or we might generally say events) are made real through the publicly shared opinions of the people who make the acts communicable. It is the collected judgments of these spectators that Hegel understood as contextualizing the event in a way that allows anyone to engage with it and perceive its meaning within the whole of history. This positioning of the subject as a spectator is fundamental to Comay’s approach to Hegel and her overall discussion of the French Revolution, with experience being increasingly understood as archival in nature. In her introduction to Lost in the Archive, Comay considers the dual etymology of arché as signifying both a promise of “command” or mastery and “the language of origins” that serves to suspend the reality of beginnings and rules because of the fact that the archive, as a “condition of the possibility of remembrance, exceeds and confounds the time of history” (Comay, Archives, 14). 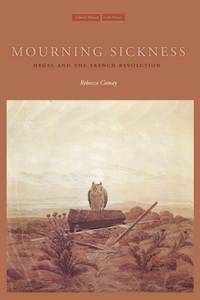 This interest in the archive is intimately connected to Comay’s treatment of Hegel throughout Mourning Sickness and, more importantly, her argument for untimeliness. In the space of the archive, history masters the world ironically through an excess historicization, in which the ‘truth’ of subjective experience is determined strictly in relation to the untimely order of history. Whatever is not included as part of history has no definable reality in modern culture because, in Foucaultian terms, its identity and the series of its differences cannot be discovered until measured with a common unit. This epistemological shift from similitude to representation is, however, not as definitive as it has often been interpreted and Comay’s untimeliness reflects this ongoing problematic; as she makes clear, the untimely operates not within the strictly representational mode that we associate with modernity, instead negotiating between this mode and the (supposedly) pre-modern search for similarities. To see the Reformation in the French Revolution represents a national act of similitude meant to override inherent differences—particularly, as Comay remarks, “the startling contrast between the breathtaking modernity of France and the general decrepitude of a Germany still mired in the swamplands of feudal absolutism” (2). Hegel’s conception of history attempts to reconcile this problematic by making similitude a category of representation, turning the Kantian in-itself into a by-product of the act of representing. What remains of this encounter—as we see with the German interest in the French Revolution—is the experience of an object stripped of experience, a specter of the world repeatedly created through the gazing of history into history. Proclaiming an end to history—along with the over abundance of other ends that mark a sense of modernity—theorists from Hegel on have avoided confronting this untimely quality of our existence by structuring limitations into our represented existence (within an infinite universe). This ideal of the end functions as fulfillment through a type of death, an escape from the eternally recurring trauma of missed possibilities that plague the wills of modern subjects. We can relate this desire for an ‘end’ to a key structuring mechanism associated with the French Revolution, namely the guillotine, to which Comay devotes much of her third chapter. For Comay, this instrument of terror can in many ways be seen as the materialization of the untimely on the human body itself. “It generates a virtual theater and a theater of a virtualization—a spectacle of the unspectacular where objects and conjured up in their disappearance, disappearance is materialized, and repetition itself acquires an aura” (71). Comay’s description of the guillotine speaks to the general conditions for modernity and the source for the cultural disenchantment facing the modern subject, since within this theatre meaning is only the meaning created. Yet part of the cultural meaning of the guillotine is the inherent fascination of witnessing the spectacularly violent endings of an excessive number of lives, which notably occurs in front of mass audiences of spectators. This fascination operates on the interest in and need to discover meaning in experience, which the subject encounters most fully after the fact as a spectator—like Hegel and the French Revolution. Hegel’s fascination, however, is also a type of boredom that is crucial to the untimeliness of both the move towards history and the possibility of its end. For Comay, “Hegel is the first to notice the strange mixture of thrill and boredom” specifically in relation to the guillotine, the repetitive and inexpressive functions of which prove a short-lived experience that is soon recognized as an impossible experience (72). Subjective will in this context is the desire to find or create meaning where none exists, turning the unspectacular fragments of a lost past into the spectacle of a future history. On the scaffold of the guillotine disappearance is materialized through the physical and temporal repetition of experiencing loss as history—which, to somewhat extend Walter Benjamin’s proposal, allows objects to acquire an aura through the untimely balance of historical thrills and boredoms. Hegel, Comay tells us, suggests that boredom “is not just the antithesis of fascination,” but instead the two are actually the same (72). It is this boring fascination that defines the modern subject-spectator as a discoverer of untimely meaning and a creator of the world as a representation of untimeliness. The burning centre of Comay’s argument is the question of the modern condition that she articulates in and through the notion of untimeliness, a concept of indisputable significance for many prominent theories of modernity and contemporary thought. I have been profoundly affected by Mourning Sickness, particularly in the strength of Comay’s ability to communicate a vital area of philosophical research that, to my mind, is seriously underrepresented: the gap that we recognize beginning most powerfully in the 19th century between the self and world, in which subjectivity is experienced as out of step with lived existence. In this text, the French Revolution is to Hegel what Hegel is to us: an experience that is always already missed, even as we wait for it to occur. This is not to say that Comay herself fails to communicate this untimely relationship, quite the contrary. Her approach embodies the abstract power of untimeliness, presenting us with a representation of Hegel that (to borrow two important terms she employs) sways back and forth between a horror vacui—a fear of the void that Germany in particular experienced in comparison to the revolutionary events in France—and a Tabula Rasa—the blank slate that invites the terror of a missed experience. In this way Comay, like Hegel, “turns thought to the order of experience, even if it is a questions of a missed experienced, a lapsed experience, or even, in the end, another’s experience” – such as my untimely experience of this timely book (153). Arendt, Hannah. Lectures on Kant’s Political Philosophy, ed. Ronald Beiner. Chicago: The University of Chicago Press, 1992. Print. Comay, Rebecca. Introduction. Lost in the Archives (no. 8). Toronto: Alphabet City Media, 2002. Print. Hegel, G.W.F. Phenomenology of Spirit, trans. A.V. Miller. Oxford: Oxford University Press, 1977. Print. Kant, Immanuel. Conflict of the Faculties. In Religion and Rational Theology, trans. by Allen Wood and George di Giovanni. Cambridge: Cambridge University Press, 1996. Print.